On a cold winter morning in Oklahoma City, my father and I looked out the living room window and glimpsed something unusual in the middle of the street: a coatless man lying in the fetal position. It was around 6 a.m.; the sun hadn’t peaked yet. The darkness prevented us from recognizing the man until we got very near to him. That’s when we realized he was our next door neighbor, Miguel. He had too much alcohol the night before, and he passed out before making it to his house. My dad and I helped Miguel get back on his feet, walked him to his house, gave him a glass of water, and accompanied him to his bed. Later that evening I asked a friend of mine to come with me to Miguel’s house to pray. So I picked up my Bible, my Catechism, my Rosary, and my guitar and walked over to Miguel’s place. When we got there we were a little uneasy because we were uncertain of how he or his roommates would respond. One of his nine roommates opened the door and after we asked for Miguel, he let us in. We asked Miguel if we could pray for him. “Yes, of course,” he replied. We prayed and sang a few praise songs. We also read a few paragraphs from the Catechism and a few Bible verses and shared the good news of Christ with everyone in the house. After we prayed, Miguel confessed that he had truly enjoyed the experience and that he actually felt better. The following day Miguel called me and asked me to come back to his house to share the Gospel the following week. He had experienced the love and mercy of God like never before and had decided to change his life and renew his relationship with Christ and His Church. Miguel was baptized and raised in the Catholic Church back in his Guatemalan hometown, but had left the Church shortly after arriving in the U.S. seven years before this powerful encounter with God. Now, he was convinced that God had a purpose for him, and he was ready to share the good news of Jesus with everyone he knew. That started right away when he invited everyone he knew from his native hometown into his house to hear the Gospel. We decided to meet at his house at 11 p.m. since most of his Guatemalan peers worked two or three jobs from dawn to dusk. That Wednesday night we gathered about 20 young and middle-aged men. This was nearly 10 years ago. Today, different families host a group of about 60 men and women in their homes every Wednesday night to share the good news of Jesus Christ. Miguel left his home and family in Guatemala 15 years ago and traveled to the U.S. hoping to find a better life. 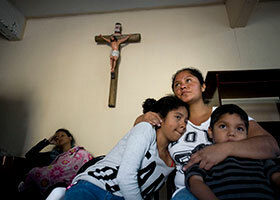 “I left Guatemala and came to the U.S. because my family was in serious trouble. My brother had to borrow some money because our family was going through a hardship, but the people he asked the money from became hostile and threatening. There was no way we could ever earn that money back in my hometown. That’s why I decided I had to migrate to the U.S. so I could work and pay the family debt off,” Miguel said during one of the prayer meetings. “It wasn’t an easy decision to make at all,” he recalled. “It was difficult. We had to pay the coyote [an immigration smuggler] several thousands of dollars and that made us be in more debt. “Once I came here I felt alone. I didn’t know anyone and I missed my family very much. I wasn’t really evangelized back home so I left the Church and started drinking all the time to forget about my solitude for a while. Thank God I have found my way back to the Catholic Church, my mother." There are many stories similar to Miguel’s experience. Just in the Guatemalan prayer group alone the stories of these men and women are difficult to digest. A good portion of young men come to our country with the sincere intention to work, save some money, and return to their hometown to build a house for themselves and their parents. But many of them unfortunately get entangled in the vicious lifestyle of our money, drugs, and party culture and soon enough lose the focus of why they came in the first place. A lot of these folks come from the poorest of the indigenous villages where there was hardly a priest. The Eucharist wasn’t celebrated often, little or no catechesis was offered, and popular Catholic traditions and beliefs were mixed with other native devotions and pagan superstition. Others came fleeing gang, cartel, or domestic violence or death threats back in their native towns. Many of them couldn’t afford elementary education because they had to start working as young as four. Most have escaped extreme poverty and disease-ridden environments without the possibility for medical treatment. They weren’t sent here by their governments. The idea that these governments “do not send their best” is just absurd. However, most of these immigrants are among the best humans I have ever met. They have wonderful family and moral values! Sure, in every culture, ethnicity, and race there are people who will do evil and perform criminal activities. Those people should have no place in our society. But all the good, hard-working immigrants shouldn’t pay the consequences just because of a few “bad” people. They didn’t come to steal our jobs. Most of these immigrants work hard for low wages. Most are happily willing to work in any honest job with few demands. That’s why many employers and corporations take advantage of them. They didn’t come to live off taxpayer dollars. In fact, unless an undocumented parent has a U.S. citizen child, it is impossible for them to receive just about any form of state welfare. They can’t “just come here legally” or “get in the back of the line” like many Americans would want them to. Unless an undocumented person marries a U.S. resident or citizen, eligibility for a green card that establishes legal residency is very restricted. The wait for a family- or employment-based visa may be longer than 20 years, depending on a person’s country of origin. Also, asylum is hardly granted to people coming from many of these Central American countries, much less from Mexico — even if the threats are credible. Those fleeing gang or cartel violence can’t simply seek protection from their governments or law enforcement. Most of these people are Catholic. 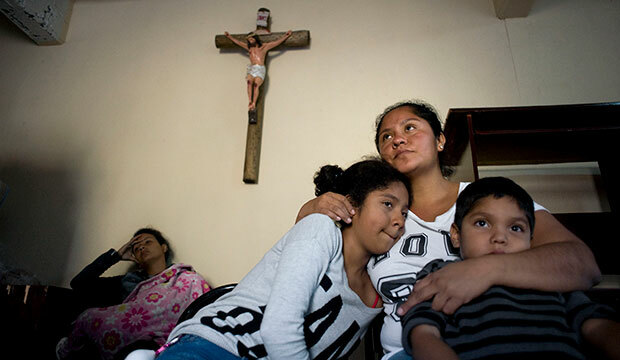 I find it sad and sickening that when they arrive here and receive a hostile response from their fellow Catholic Americans who wish to “deport them all” or push for the construction of a wall to keep them out, they are turned off and away from our Church only to find solace in other faith congregations. “The Church considers the problem of illegal migrants from the standpoint of Christ, who died to gather together the dispersed children of God (cf. Jn 11:52), to rehabilitate the marginalized and to bring close those who are distant; in order to integrate all within a communion that is not based on ethnic, cultural, or social membership, but on the common justice. 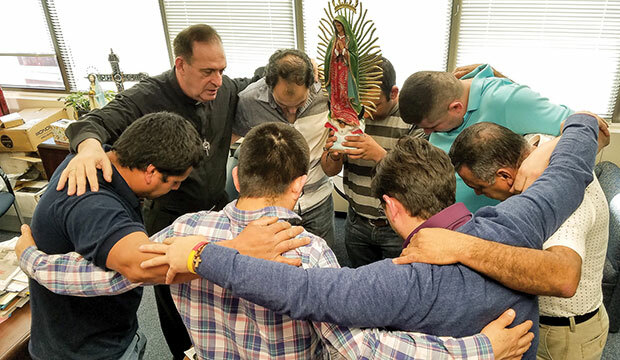 We call upon pastors and lay leaders to ensure support for migrant and immigrant families. We urge communities to offer migrant families hospitality, not hostility, along their journey. We commend church communities that have established migrant shelters that provide appropriate pastoral and social services to migrants. We encourage Catholics and all people of good will to work with the community to address the causes of undocumented migration and to protect the human rights of all migrants. We call on the local Church to help newcomers integrate in ways that are respectful, that celebrate their cultures, and that are responsive to their social needs, leading to a mutual enrichment of the local Church. We ask that special attention be given to migrant and immigrant children and youth as they straddle two cultures, especially to give them opportunities for leadership and service in the community and to encourage vocations among them. Since the foundation of the Guatemalan prayer group nearly 10 years ago, many of its members have been baptized, received the sacraments of Confirmation, Holy Communion, and Holy Matrimony, and most of them are regularly receiving the Sunday Eucharist. 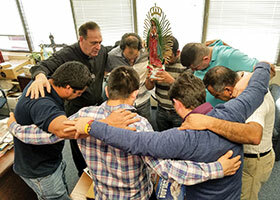 My friend Miguel and our Guatemalan prayer group is a story of success where the Church was able to lovingly embrace them without any sign of hostility. Unfortunately, many of our fellow Catholic immigrants haven’t had the same positive experience. I pray that those of us who bear the title of Catholic may put our allegiance to our country and its laws and political party affiliations in second place while prioritizing our allegiance to Christ, His Holy Church, the Vicar of Christ and the Successors of the Apostles on matters of faith and morals.